Why do we tend to focus on what's urgent instead of what's truly important? Imagine. 24 hours of digital silence. No phones. No computers. No TV. Just valuable time with the people you love, to do all the things you've needed to do but never quite found the time for. We invite you to explore the mystical, psychological, social, and cultural dimensions of Shabbat as we unlock a model for achieving balance and serenity in the modern age. Over six weeks, we’ll uncover timeless principles for how to achieve a life of inner peace while making each workday more productive and fulfilling. Sign up today for a remarkable experience. What role does net worth play in how we define our success? The gift of Shabbat provides a priceless sense of self-worth in our most basic state, without feeling the need to achieve. 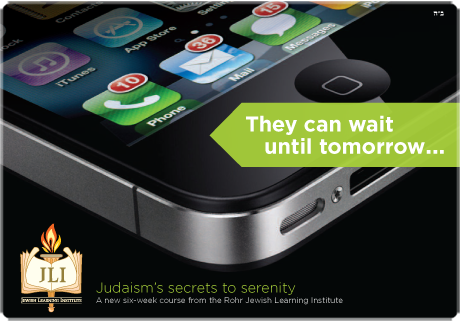 The serenity and enjoyment of Shabbat is the culmination of a week’s work. Jewish culture’s emphasis on preparing for Shabbat presents a model for getting more out of life’s experiences by maximizing the effort we invest into shaping them. The light of the Shabbat candles and heightened spiritual awareness on Shabbat illuminates the need to value the uniqueness of others and to invest in family and interpersonal relationships. This lesson outlines a clear roadmap for how to approach conflict resolution. In this time of great bounty, we have never found it harder to negotiate moderation with healthy pleasure. Shabbat’s definition of holiness is a prototype for how to synthesize spirituality and enjoyment. Shabbat offers a transcendent frame of mind to objectively evaluate our work and add meaningful focus to our pursuit of a satisfying career. Shabbat’s neat construct of thirty-nine creative activities offers a framework to define a life of purposeful accomplishment. From the multisensory experience of Havdalah, we learn how to introduce serenity into the chaotic moments. By identifying the spirituality within the mundane, we transform our week into one that is entirely Shabbat. "Shabbat is as relevant today as it was in the desert thousands of years ago... You'll be so energized and productive the next day you'll accomplish more than if you'd worked right through it. So go ahead, unplug." "On the level of the individual to the level of culture, the ills we experience, by and large, result from mindlessness. The wisdom discussed in Toward a Meaningful Life should be widely read to help provoke a reversal of this trend and lead us to mindful lives full of everyday meaning." "Shabbat is one of the greatest gifts of Judaism, and it can be appreciated on so many levels; each level building on the one before it to create a true harmony of spiritual, ethical, and personal growth every single week. Oasis in Time layers learning about the beauty of Shabbat in an intimate and comprehensive fashion. The wisdom contained has the potential to truly transform your life, your relationships, and your concept of purpose on this Earth. That's a mighty task, but it is easier than we think. I implore you to learn about Shabbat, put it into practice, and watch the miracles begin." “I had a life that anybody would have wanted. But after retiring from the NFL, somehow something didn't feel right. I was starved for inspiration. As an athlete, I had inspiration, but as a human being I didn't. I felt lost when the cheering stopped. It was not until my first Shabbat experience that things started to change. As a football player, I loved the games, the challenge, the competition, the camaraderie... But today I get a charge from different things. Even the feeling of coming out of the tunnel at Lambeau Field, home of the Green Bay Packers--beautiful blue sky, the smell of beer and brats in the air--can't compare to the rush of Shabbat. Find your inspiration--learn about Shabbat with JLI."